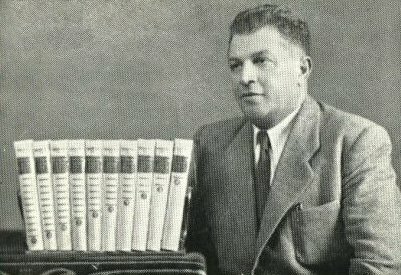 The monumental 19-volume Encyclopedia of the Founders and Builders of Israel was compiled and published by David Tidhar (1897-1970) over the 23 years from 1947 until his death. His varied careers as British policeman, private detective, author, and communal leader made Tidhar ideally suited to compile this Who’s Who of the Jewish community of the Land of Israel (Erets-Yisrael in Hebrew). In addition to original articles about political activists and other of his contemporaries, the first several volumes also contain material about 19th century settlers culled from local histories published in the preceding two decades. In each volume, Tidhar requested submission of biographical information and photographs from relatives of early settlers* which he used to compile some 6,000 biographies. His work represents the only biographical source for many of those included. Though Tidhar is famously scant in providing sources, his Encyclopedia is itself widely cited, having become the preeminent source in this area. With the dissemination of this online version, Touro College in conjunction with the Tidhar family is proud to make this classic reference work freely available to the public. Born Todrosovitz, David was already active in his youth in communal affairs, including driving out Christian missionaries set on ensnaring Jewish souls in Erets-Yisrael. Already by World War I, he had begun his long career of establishing organizationsI: one to provide clothing and shoes to the Jewish poor, and another, a sanitary corps to provide instruction on avoiding cholera during the 1916 epidemic. Tidhar volunteered in 1918 for the Jewish Legion, and was also among the defenders of Jaffa’s Jews during the 1921 Arab riots. He was an early member of the Haganah self-defense organization. He joined the British-run Palestine Police in 1921, where he served as the commanding officer in the New City of Jerusalem until 1925. Throughout the years he put his particular knowledge of Arab affairs and of the British Mandatory government at the disposal of the Jewish community and its institutions. Once, in 1924, Officer Tidhar entered the lion’s den of anti-Semitism by approaching the car of the blood-thirsty Mufti Amin al-Husayni, and demanded from him to stop the bloodshed immediately. He helped all who asked his assistance, which included aiding Jerusalem’s Orthodox Jewish community. Tidhar was not a member of any political party, was friends with all factions, and assisted everyone. He was actively involved with numerous organizations and was constantly at work. In 1924, he published (in Hebrew) Criminals and Crimes in Erets-Yisrael which was translated into Arabic and English, and was the first such work written by a Jewish officer. Though this was to be the start of a prolific writing career, he continued to be active in numerous organizations throughout his life. In 1926, he opened a private investigation bureau, the first of its kind in Erets-Yisrael. In the early 1930s, the newspaper reporter Shlomoh Ben-Yisrael featured Tidhar as the protagonist of his fictitious weekly detective novelettes. This effort is considered to be the progenitor of Hebrew detective literature. 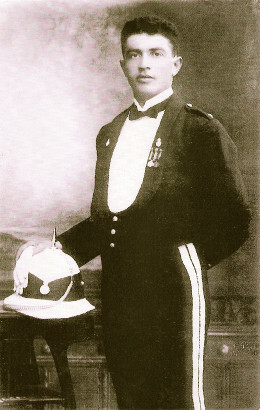 Tidhar based the stories on his experiences in the British constabulary. During World War II, he tried to destroy the Nazi fifth column among the Arabs of Erets-Yisrael and in neighboring countries by uncovering their weapon suppliers and reporting them to the British police. He did all of this and more without reaping any personal reward. With the success of his Encyclopedia, he turned to full-time writing and publishing in 1950. His other published works include: Between Hammer and Anvil (1932), a collection of articles; In and Out of Uniform, memoirs of his public activity from 1912 until 1937; The Maccabi Album, Jaffa-Tel-Aviv (1906-1956) and In the Service of My Country, containing memoirs, documents, and photographs from 1912-1960. * His large collection of documents and photographs now resides at the Archives Department of the National Library of Israel in Jerusalem as the David Tidhar archive, ARC. 4º 1489. The staff of Touro College Libraries and the Encyclopedia project team would like to extend our thanks to the many people who assisted in bringing this project to fruition, particularly Bezalel Tidhar and Esther-Rachel Weitz, the children of David Tidhar; Gal Almog, the son-in-law of Bezalel Tidhar; Benjamin Ronn; David Ronn and Dr. Jacqueline Maxin. Special thanks to Stephen Morse, who graciously allowed us to adapt his English-to-Hebrew transliteration algorithm for our site.